Japan is the land of gift-giving; for many foreigners who come to live and work here, the ritual of exchanging presents at almost every given social opportunity can take some getting used to. Going on a trip to Sapporo over the long weekend? Be sure to bring back a box of shiroi koibito cookies for the office. Valentine’s Day? Not just for your significant other — you’ll need to give giri choco (“obligation chocolate”) to your boss, and tomo choco (“friend’s chocolate”) to your mates. Visiting a friend’s home? That’s where temiyage comes in — it would be rude to show up with nothing. Of course, since the gift-giving cycle involves everyone, you can expect to have a great time being on the receiving end of presents, too. If you’ve given something, you’ll get something in return, then be obliged to give something back to say thank you. Then that person will give you a gift to say “no, thank you” and so on. Basically, Japanese gift-giving culture is a never-ending cycle of win-win generosity. 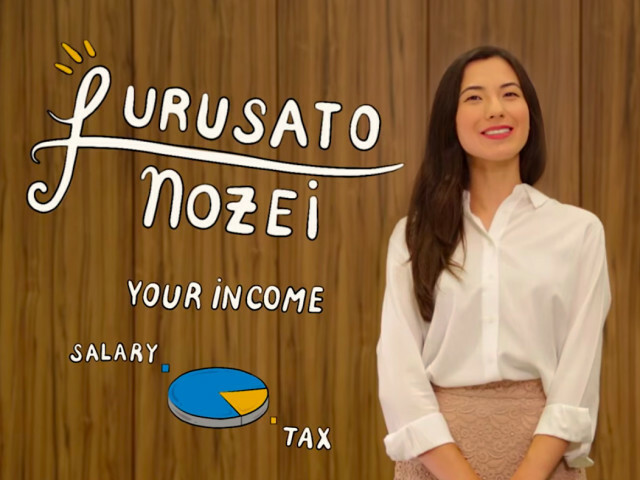 Taking a leaf out of Japan’s cultural book, the government introduced the Furusato Nozei tax incentive scheme; a system where you pay taxes to another prefecture — instead of the one in which you live — and receive a local gift from that prefecture in return. Gifts can be anything from an onsen experience to a soccer uniform to two years’ supply of bags of rice delivered to your door. Lack of information in English and other foreign languages has meant that many foreign residents haven’t been aware of it — until now. Furusato Nozei is open to every person who pays income tax in Japan, whether they were born here or not. The tricky part used to come with the various Japanese forms you had to fill out in order to take part in the scheme. But the good news is that there is an extremely helpful website called “Furumaru, Gifts for Furusato Nozei” that will guide you step by step through the process, outlined in their video below. The scheme was started back in 2008 to help redistribute tax revenue from the Tokyo megalopolis to prefectures throughout the country, facilitating the development of less-funded rural areas. Taxpayers could choose to “donate” their nozei (tax payment) either to their furusato (hometown) or another municipality they liked, often in support of a particular local project. The tax that they paid would then be deducted from their tax bill later. So, if you wanted to enable students to study abroad, reduce the cost of local daycare, or you were keen to get behind rural entrepreneurs, well, you could do so through your taxes. By way of a thank you, the local government would then send a gift; usually something specific to the area like food, crafts or an experience encouraging donors to come and visit. Combine the feelgood factor of supporting a community and the possibility of receiving a free gift and you have a genius recipe for motivating huge numbers of the population to redirect their payments. The total sum of donations jumped from around ¥10 billion to more than a reported ¥280 billion in 2016. Many municipalities are already seeing the benefits; the remote town of Kamishihoro in the far north of Hokkaido for example has been able to provide a free day care center, which in turn has led to an increase in the local population. The scheme has also aided in the recovery of areas affected by natural disasters such as the 2011 tsunami in Tohoku and the 2016 Kumamoto earthquakes. As such, local governments are really enthusiastic about offering and delivering the best products from their area. This video shot in Saitama prefecture shows just how much effort goes into a thank-you gift through Furusato Nozei. Really? This sounds too good to be true. Right, which is why you’ll need a little bit of effort and patience to reap the rewards. Still, even though this is a government scheme involving lots of other smaller governments, it’s surprisingly straightforward to do. Head to en.furumaru.jp to start the process. First, you’ll need to determine the amount you’re eligible to pay from your tax bill using their Payment Simulation calculator. Then choose where you want to donate that portion, either by searching for a gift you like or a municipality or cause that you would like to support. Lastly, you’ll need to temporarily pay for your gift, along with a one-time payment of ¥2,000 (a kind of registration fee). Then just wait for the goods to be delivered. The complicated bit comes at the end of the tax year when you’ll need to claim your money back. There are two ways to do this: 1) via your Income Tax Return or 2) with the new One Stop Exemption system. For 1), follow the website’s comprehensive “How to file your Tax Return” page which will guide you through the process of creating a tax return on the National Tax Agency website. Make yourself a cup of tea before you get stuck into this. Once done, print it out and post it to your local tax office along with the necessary documents, including the receipt you should have received from the municipality you donated to with your gift. Number 2) is easier. All you have to do is submit the “Donation Deduction Application Form” to the local government to which you donated. They should have sent you the form with your gift, or you can expect to receive it at the end of the year. Just in case, it’s also available online from the relevant government website. Nice. Tell me more about the gifts! If you’re still stuck for Christmas presents, the Furumaru website is an absolute goldmine of unique gifts from across Japan. How about a handmade watch from Hiroshima for your SO? A beautifully carved hanko from Yamanashi for your Japanese teacher? Or a box of craft beer brewed in Miyagi to bring to that Christmas get together? YouTuber Tokidoki Traveller made this video about her private onsen experience which she received after donating her tax to Fukushima. The Furumaru website are also currently offering new users the chance to win a Canon 5D camera until the end of January 2018. Most people file their taxes around December time and if you’re going through the One Stop Exemption system you should send your deduction form before January 10. Those filing Income Tax Returns have until March 15. And that’s pretty much it! If you’re going to pay taxes anyway, why not support a good cause and get a gift at the same time? It’s the definition of win-win. Plus — it’s Christmas! Then they work out that the national government isn't getting enough in tax revenues, and they put the taxes up to compensate. I just clicked on a link here on this site to an ad for a "full-time ALT" job. That's like $20K/year. You'd make more working at McDonald's. How much tax revenue do they think they'll get...?